1. The film opens with the LaRussos moving from ________ to ___________. 5. We first hear the mighty bellow of John Kreese as Daniel unwittingly visits the Cobra Kai dojo. Kreese calls out three things that do not "exist in this dojo." Which of the following is not one of them? 9. If you're a fan of the movie, you remember that Daniel wore a shower costume to the Halloween party. But can you describe the shower curtain part of the costume? 11. Indicating three points on the body, Miyagi stated, "Karate here; karate here; karate never here." Where did he point to as he said this? 16. During his "training," what task was Daniel instructed to do via a note that Mr. Miyagi left taped to the window? 17. 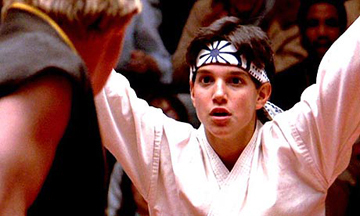 What was the correct sequence of the tasks that Miyagi had Daniel perform? 22. Johnny got Daniel to embarrass himself when the Cobra kissed Ali against her will. Where did this take place? 26. The film climaxes at a tournament where Johnny faces a number of Cobras. What was the name of the tournament? 27. What was the name of the Cobra that Daniel faced in the semi-final, and whom Kreese instructed to put Daniel "out of commission"? 29. What was the sequence of points scored before Daniel scored the final point against Johnny to win the tournament championship? 30. Who actually handed Daniel the tournament championship trophy?